The voice control system is woken by saying ‘Radioplayer’, then the name of a favourite station, which will automatically play on DAB, FM or mobile. ‘Wave-to-wake’, can also be used, by moving a hand near the phone. Station names are announced over the speakers, ensuring there is no need to look at the screen. If the signal varies while driving, Radioplayer Car automatically switches to a different platform, keeping drivers listening via the best method possible. Radioplayer Car also enables drivers to ‘Bluetooth’ their own smartphone music collections, take hands-free calls, listen safely to inbound text messages and receive instant audio travel news, customised by GPS to their location and direction of travel. The app and the box can both receive updates ‘over the air’, meaning that, even after purchase, Radioplayer Car can be made smarter and smarter. Video demos and more information are available at www.radioplayercar.com. The launch video is available for viewing here https://youtu.be/rneq_Ns9ADA, and demonstration of the system and a short interview with Michael Hill, Managing Director or Radioplayer, can be seen here https://youtu.be/upAgNEDU3hY. 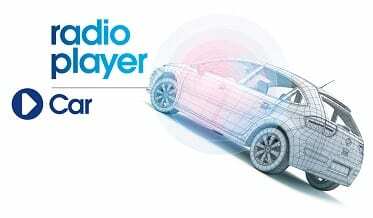 Patents are pending on several parts of the Radioplayer Car technology. The system, and the installation company, have both been awarded the Digital Radio Tick Mark, meaning they receive DAB, DAB+, and FM, and are ‘future-ready’.